At BIG WATER DOCKS, LLC, we strive to build the longest lasting marine structures that will handle the toughest conditions. Our wood pile boat docks are the same designs built along the coastline. If these docks can handle the harsh saltwater environment and constant waves, then they will definitely stand up to what Lake Eufaula has to offer. When you've been in business as long as we have and faced the same challenges, you learn a few things. Or, in our case, more than a few. We not only have simple, ready-to-implement solutions for almost every problem, we have the resources for them, too. And, if you bring us something new, we would love to work with you to find the solution. Whether its Wood, Steel, or Aluminum, Big Water Docks can build it. We are now an Authorized Dealer for Flotation Systems, INC. ALUMINUMBOATDOCKS.COM - If you are looking for a floating or stationary , Aluminum, Wood, or Steel Dock, just give us a call. Getting the latest technology in materials will ensure your new dock will last . We are continuously researching the latest trends in Wood, Steel, Aluminum and Composites. Steel pipe stationary boat docks can have a limited life expectancy. Steel Pipe is hollow and rust from the inside and out. A wood pile stationary dock has wood poles that are very heavy duty and will support a dock and heavy boat with ease. Wood Pile Poles were used in early bridges and are still in use today. Wood Poles are proven. When you spend the money to build a retaining wall, you want a contractor that has a solid reputation for quality. BIG WATER DOCKS, LLC has you covered. All of our sea walls are installed to Corps of Engineers specifications. Steel, Vinyl, Wood, and Rip- Rap are all some of the great options available today. Seawalls help preserve shorelines from erosion. When we pay a premium for lake front property we want to ensure the shoreline does not wash away. Years of waves will eventually erode the hardest of soils and will eat away at your water front property. Let BIG WATER DOCKS, LLC install steel sheet piling to stop further erosion. With the advances in technology, a composite vinyl bulkhead may better suite you. 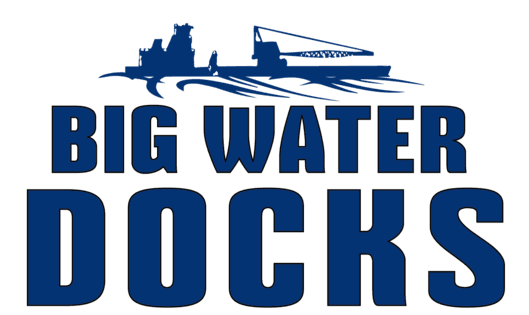 Give BIG WATER DOCKS, LLC a call today to discuss the best option for you! A boat lift is an excellent investment. A Lift will help keep you boat clean and dry. Not to mention your boat is always ready to launch with the push of a button. Adding a boat lift makes it a one man operation to get the boat in the water. Getting your family on the lake and having fun! We can help you with a floating HydroHoist style or with a Quality fixed overhead hoist boat lift. Wood Pilings can be driven in excess of 12' into the lake bottom. This is necessary to hold the weight of the dock and the boat in its housing. This depth is also beneficial to hold the structure in a tornado or hurricane. Once piling poles are driven, they are there from that point on! BIG WATER DOCKS, LLC is a leading pile driving contractor because of the use of our 3000lb drop and diesel hammers.